A ductless AC unit—a great replacement idea. The invention of the compact window air conditioning unit in the 1950s was a significant advance in home comfort. Until then, only expensive central systems could provide homes with mechanical air conditioning, and most houses didn’t have a place for the ducts necessary to transport the conditioned air. With window ACs, almost anyone could have cooled air sent into their rooms. That was then, this is now. 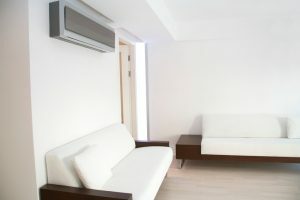 Central air conditioners are more affordable than ever, and even homes that don’t have space for a central air conditioner system with ducts have the option for a ductless mini split system. There’s just no good reason to stick with window air conditioners—and plenty of reasons to tear them out and have HVAC professionals fix your home with central air. Below are some of the drawbacks of sticking with window ACs for your home. Let’s face it—it’s tricky to maintain a balance of saving money with your air conditioner without letting your home turn into an oven. 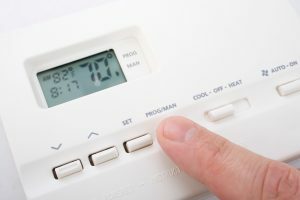 Running your AC less often is the quickest way to cut down on high electrical costs over the summer. But running your AC less is also the quickest way to have your family turn on you and start warring over the thermostat. There are plenty of ways you can cut down on your cooling costs this summer with your air conditioner in Lockport, IL. We want to focus on two basic ones—and they’re both connected to the thermostat. They’re easy steps: the first one is something you can do yourself without much effort, and the second one only requires calling our office to make an appointment.